For the third volume. The Dragonslayer starts with the Heavy Metal – Stick-Eater Prologue I reviewed earlier. After, we see how far Fone, Thorn and Gran’ma have gotten from the farm to get to Barrelhaven, which isn’t known other than they’ve been travelling for days off-road so as not to be seen. They go uphill to get a look at the valley, when they reach the top Fone tries to discover if they’ll be staying in the valley once they reach the tavern, Gran’ma Ben not saying and trying to move them along until they’re relatively safe. Then we see what’s happening in the bar, which is some of the locals are sharing personal experiences with unsettling mysteries. One man describes what happened to a man’s wife when she had gone to the woodshed. As the man goes on with the story he declines a drink from Lucius but not one from Smiley. When Smiley puts in the order for more beers and snacks, he also questions Phoney on how he’s actually going to kill the dragons, Phoney revealing he had no intention of following through since the dragons weren’t actually dangerous and to keep it down for a customer walking up. After getting another sale, Lucius demands to speak with Phoney in private to express he isn’t pleased how he’s using the dragon shtick to sell beer and wants to call the bet off. Phoney reasons Lucius must be jealous of them winning the bet and how funny it is Phoney is the one to be confessing the truth about the dragons whilst Lucius was lying, due to it being the other way around usually. Phoney then comes up with a compromise which doesn’t help Lucius much and walks back out to the bar, leaving Lucius steaming. Then we see Fone and his group walking through the wilderness when Thorn calls out to Gran’ma Ben, noticing she seems odd and she informs them she’s gotten the feeling “of bad things to come”, again. She then urges of they needing to move along quickly since she didn’t know what it was would be coming, but it was big, then we see someone speaking off-panel about Quiche and then we see them surrounded. Gran’ma Ben tries to get the two to get behind her so they wouldn’t be surrounded. The rat creatures try to convince Gran’ma Ben to give up now and surrender to being made into a Quiche which is when the rat creatures then begin their usual quarrel, Gran’ma Ben trying to take advantage of the situation and failing, but getting the rat creatures to retreat a little ways away. Gran’ma then lets them know the rat creatures arrival isn’t what her “gitchy” feeling is warning them of, since it was still happening and foretold much worse to come, then giving Thorn her sword. Gran’ma Ben then realizes the woods are quiet and they shouldn’t be, so she goes after the rat creatures, capturing one to share with her of what’s going on and as the rat creature was about to spill his guts, Kingdok shows up and throws Gran’ma Ben further into the woods, but then picks her up and we get shown Fone’s perspective, he waking up with a cut on his head and looking for Thorn and Gran’ma Ben, soon calling for the dragon for help. We then go back to Barrelhaven and see Smiley taking a nap and saying Fone’s name before being woken by Phoney, informing him they had a problem of the business slowing down. Smiley suggests a new slogan could help, but Phoney thinks they can’t do better than his current one. Smiley then divulging perhaps the patrons were saving their funds for the summer picnic, which takes Phoney by surprise for not knowing of it and then getting angry Lucius could be trying to keep him from making more money. Then Smiley hears Phoney yelling again, one of the patrons also hearing it, so Smiley goes off running to help Fone with Phoney trailing behind him. As the Bones run off after Fone, Lucius gets his customers to gather torches so they can follow. 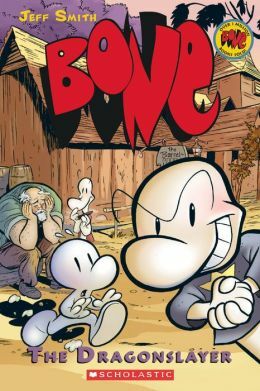 The Bones lose Fone since he stopped yelling after they’d gotten into the woods, the townspeople catching up to them now. Lucius doesn’t give up yet, though and gets everyone to scatter around for clues, someone observing blood on the ground. Then we see Kingdok throwing Gran’ma Ben to the ground, then into a tree and before he believes he’s about to make the killing blow, Thorn comes at him with the sword, taking one of his arms. Kingdok is so overcome with pain, he believes he’s seeing Gran’ma Ben and Thorn in their true forms. After, Kingdok screams for the rat creatures who come running and then all retreat deeper into the woods. Gran’ma Ben then comforts Thorn with the words of knowing the rat creatures wouldn’t be coming back anytime soon since it was their way, Fone then detecting them. Thorn notices his cut head, which he speaks of as looking worse than it was, Gran’ma Ben then believing she needs to admit to Thorn the important information of the Lord of the Locusts looking for her and she must keep herself hidden from him no matter what. We then see the two rat creatures in panic-mode, first believing Kingdok is dead and then trying to stanch his wound, they discussing the fault of the incident being bandied between the two of them and then realizing if Kingdok did die, the Hooded One would torture them. When they realize Kingdok’s wound has stopped bleeding they decide their best course of action is to flee and not return which they immediately begin. We then go back to Thorn trying to inspect Gran’ma Ben’s arm as Fone fools around with the detached appendage on the ground. Gran’ma Ben continues to try and inform Thorn of something she doesn’t know yet whilst she tried to bandage her arm, she confiding Thorn was an “awakened one” and had a rough track ahead of her, she then explaining the details and how the Agents of the Locust will be hunting her, this being the reason they were heading for Atheia, Thorn declining this destination since she was now rebelling against her Gran’ma who tried to convince her what she was revealing was true, but Thorn wasn’t having it and walks off. Gran’ma Ben then tries to convince Fone to go after her and bring her back, but Fone is having trouble agreeing with Gran’ma Ben now too, she giving Fone her sword and agreeing with the both of them in surrender, ordering Fone instead to get her back to Barrelhaven Tavern safely. Gran’ma Ben makes sure Fone relays the message of what the rat creatures were up to when Fone found Lucius and gave Fone her locket as proof and truth of the information about the Lord of the Locusts. Fone catches up to Thorn and they both head back to the tavern where they run in to a wall with Jonathan guarding it and being told of how he couldn’t let them in since whomever was in charge inside since Lucius hadn’t returned told him anyone outside the walls was a stranger, they then seeing who is giving the orders. Then we see the Hooded one relaying word from the southern front and how the Lord of the Locusts was in charge of the East once more, he asking of Atheia. He describes the area awaiting the Lord of the Lucusts’ orders and he then informing where the Bones and Thorn were, the Hooded One promising the town’s destruction and the Lord of the Locusts giving voice to his approval of the Hooded One’s service. The Lord of the Locusts then disclosing if they failed to acquire Thorn alive, she must then be destroyed, but the Hooded One being commanded not to give way. The Hooded One then tries to convince the Lord of the Locusts to suffice with his service and he not needing Thorn, hoping to destroy her, but the Lord of the Locusts communicates of needing to keep her powers within his grasp if possible and won’t be forgetting the Hooded One’s loyalty, then going on to stroke the Hooded One’s ego in preference of one day releasing the Lord of the Locusts’ bonds so he could properly reward him. We then go back to Phoney asking the townspeople how long it had been since they’d last seen Lucius, Fone, and Thorn being let into the town. Fone then asks why he keeps hearing people refer to Phoney as the Dragonslayer, Smiley almost letting loose with what had occurred and Phoney shutting him up and escorting them indoors where dinner and drinks awaited them. Thorn decides to rest and Fone goes to dinner with his cousins, but before we join them, we see the Hooded One seeing Thorn in her imagined form as she slept. When Fone enters his cousins new digs, he’s impressed with its royal touches and immediately asks what the blockade and upgraded lifestyle was all about, Fone displaying his disgust and Phoney defending himself by assuring the townspeople won’t be helped if they’d rather live in fear. Phoney then confesses of he having a plan which will eventually get them out of town and back to Boneville on the upswing of riches, Fone revealing his plans to stay. Phoney then figures the reason for Fone wanting to stay and tries to persuade him to forget about her since she didn’t see him the same way, Fone trying to make him realize he didn’t mean it the way it sounded and was referring to the issues of the rat creatures and problems involving them, leaving the two of them to wonder how they’d get a dragon without Fone’s help. Fone is shone harrumphing outside about his sensing Phoney trying to get his help with something and of course Fone then having to figure a way to help him out of the issue when he hears something and hoping it’s only a small animal looking for food, when he’s confronted by the creature. He’s then rubbed up against by an iddy rat creature. We then see Thorn in her other form, following her Gran’ma looking like she had in her younger days, motioning toward a tunnel in a mountain. Thorn tries to shout to her not to enter, but then a hooded figure which also turns out to be her Gran’ma instructs her to allow her to proceed, stating she’ll chance upon shelter there, but whilst she tries to convince Thorn to go inside the cave with her, someone is waking Thorn up and we see the hooded Gran’ma get angry because of this. When Thorn is awakened, Fone updates her of their new problem and shows her the iddy rat creature, she not taking this well at all and demanding to get it out of her room or she would kill it. Jonathan is first to see Lucius return, Phoney then is wakened to give him the news, Phoney ordering the person at his door to let Lucius in and keep him comfortable whilst getting Smiley to round up their militia. Lucius is caught up to what had been going on in the town and Fone gets Smiley’s attention for his help in the stables. Meanwhile Phoney is updating Lucius of how he’d kept up the protection of the town and once revealing where Lucius would now be staying, he not taking it well at all, but being protected by the townspeople so Lucius declines Phoney’s offerings of placement in preference to the barn. We then see Fone showing Smiley the tot rat creature and Smiley noticing how the ears were different and whether he knew any tricks. Smiley tests the iddy rat creature’s ability to listen and is impressed with his first attempt, Fone then noticing someone was coming in and trying to hide the rat creature, Lucius being the visitor and asking Fone of the whereabouts of Thorn and Gran’ma Ben. Fone reports to him of everything he knows plus what Gran’ma Ben wanted him to relay which Lucius realizes is similar to an attack the rat creatures had implemented before. Fone continues to fret about Kingdok and their danger in the woods, Lucius realizing they needed to get to Thorn. Then we see the townspeople about a fire and how one realized Lucius did have a point in confessing there hadn’t been an invasion of dragons in the town and it had gotten him thinking. They began considering if they were stuck in there with a dragonslayer, they may as well get the slayer to go out and dispose of the dragons so they weren’t trapped indoors. We then see Lucius visiting Thorn and comforting her when she breaks down, Fone and Smiley standing nearby. Meanwhile the rat creatures are being given a speech by the Hooded One about the new laws the Lord of the Locusts has decided upon and ending with the declaration they will take what is theirs. We then learn anyone who lived outside the village was given accommodations within the walls of the barricade. When Phoney reaches the point of not getting a hearty meal, Wendell informs him of what the townspeople had agreed upon. Phoney comes down hard on the man and reveals he’s aware of their midsummer’s day picnic, informing him to gather what they’ve hoarded and meet him in the center of the compound at dusk, ready to teach them a lesson. Phoney then circles his thoughts back around to where Smiley could have gotten to and still planning his escape from town. He then goes to Lucius to collect tax for the newly placed families, but Phoney uncovers they’ve already taken all of his chickens, putting a back tax on Lucius until the next day. We are then shown Fone swiping some foodstuffs from the kitchen and going to the stables where Smiley is with the iddy rat creature, to Fone’s surprise, discovering Smiley was collecting food for the iddy all day, but the food Fone had brought would be made of good use by Smiley, Fone relaying to him they’re going to have to change the iddy rat creature’s point of venue because of how close it was to Thorn still. Fone comes up with the plan of needing to at least get the cub out of the compound if not all the way to the eastern mountains, he then hearing someone approach and we discovering it to be Thorn. She confides to Fone of knowing the cub is in the barn and came to apologize for her behavior, she then confiding about her dreams becoming stronger and she not having been able to sleep, then confusing Fone with the talks of wanting to go home, but she meaning the farmhouse. Fone reminds her of it being dangerous still, but she not caring so Fone tries to convince her to come with them to free the cub, but she doesn’t want in on the plan, Fone resorting to trying to get her to at least rationalize her decision before she went through with it. When Fone mentions Gran’ma Ben’s instructions for Thorn to go south to Atheia, Thorn gets irritated about Gran’ma Ben leaving them and Fone admits they don’t actually know what happened so they shouldn’t think about it. Thorn then gives Fone the sword with the intention of he returning the sword to Gran’ma Ben if he thought he’d be seeing her again, Fone declining, but Thorn already leaving. Fone goes out after her and Smiley follows, he noticing all the people gathering into the square. Fone then sees Thorn head into the tavern, he chasing her and Smiley asking Lucius what everyone was doing, he sensing Phoney was about to make a speech. They soon ascertain Phoney had the intention of getting everyone to gather all their valuables since the hoarding of goods wouldn’t help them keep the dragons away. Lucius steps forward after and Phoney doesn’t spare him in the villagers eyes, going so far as to back him into a corner of silence and making it seem he was doing the bidding of the dragons. After Phoney then speaks of his plans on what they’d be doing with all the loot he ends the meeting and Smiley asks Lucius why he’d lied to everyone about the dragons existence. Fone then comes out to report Thorn locked herself in her room and how he wished Gran’ma Ben would return. Then we observe the Hooded One commanding the masses to destroy the enemies, Kingdok getting his own mission of bringing Thorn and the Bones to him. We then see Thorn’s shadow in the woods and a letter in her room left for Fone, he being outside and looking for Thorn with Smiley, but they most likely having to get the cub out of the compound without her. They get out no problem, but Smiley keeps going, Fone chasing them now. Phoney is then seen with Jonathan and making sure everything was set for their trek with the treasure the next morning making sure Jonathan would uncover his cousins soon so he could implement his greatest plan, then Ted the bug shows up. At first Phoney doesn’t remember him, but then Ted admits to knowing where his cousins are and not saying since he’d heard Phoney was planning on dragon-extinguishing, Phoney resorting to confiding his plan to Ted so he’d offer him knowledge of where Fone was. Ted imparts the last place he’d seen him and then gives the imparting words of what was in for Phoney if he kept up his crooked ways, Phoney taking his words lightly. When Phoney reaches the barn, he steps on the abandoned sword and hears something still inside, thinking it’s Fone, but no one appearing and when he leaves, the one inside taking the sword. Thorn is next seen in the woods sleeping and being discovered by a group of hooded figures, she next waking in the woods with the sword next to her and hearing noises, which makes her run and then fall right next to the Red Dragon who greets her. Thorn then realizes she’s dreaming and sees a throne in the distance, she seeing rat creatures and after being too frightened to see what else is there, but peeking to see Gran’ma Ben and possibly someone else, realizing it was Fone and Lucius then deciding she wants to wake up, determining she won’t be going down without a fight anymore and wished to return to her friends. Thorn awakens again and the sword is next to her, she running off and we next seeing the compound again with the townspeople awaiting Phoney to come who arrives after and relates of his cousins not returning the last night. Phoney then goes through with his plan since the people are aware if they wait any longer it will be after nightfall when they reach their destination, Phoney revving them up before getting on their way. It’s well after nightfall and Phoney is driving them on even though the people nearest him thought they should stop near the bottom of the mountain, but they soon reaching the Dragon’s Stair. He gets the townspeople to set up before they leave him and whilst they’re setting up the first part of their trap, Ted shows up asking if Phoney was planning on leaving his cousins, he stating how they’d left him and then revealing how he was planning on leaving the town as planned with the treasure, Ted deciding to help get Phoney out of the valley, but then the townspeople come to him with the news they’d caught a dragon and sure enough, the red dragon is hog-tied in the trap to Phoney’s surprise. When Phoney approaches the dragon, asking how he could’ve gotten trapped, he determines the dragon was there to help him with the plan. Soon the men have moved in to tie the dragon a little more snugly including his mouth so he couldn’t breathe fire, Phoney trying to get them away from the dragon. The townspeople were done waiting, though and make Phoney aware he’s at the end of his stalling, especially since the sun was now dawning. They threaten Phoney with being a part of the sacrifice if he didn’t complete the task, he ready and shielding his eyes when Thorn stops him. She then asks what mess he’s gotten himself into when they notice a fire coming from their town. The townspeople are close to hysteria, wanting the dragon to be killed and Thorn continues to try and get them to realize the dragons aren’t the trouble but the rat creatures who have started the fire and they needing to release the dragon. Although when the townspeople next insist upon the dragon’s death, they are supported by the rat creatures saying if the townspeople wouldn’t, they would which then brings the panic around to their presence. Thorn is ready to defend the dragon when the hooded figures come from behind her and fight off the rat creatures, Thorn unbinding the dragon, who promptly uses his flame to bathe the rat creatures which successfully makes them retreat. Thorn tries to ask where Fone and her Gran’ma are, but the dragon takes only enough time to let her know if she’s in trouble, where she can find the dragons and takes off, she then asking Phoney where Fone is, but he also not knowing, of course. When she learns Lucius is back in town she tries to get the townspeople to arm themselves with anything they have and they being in shock they’re actually at war. Which ends this volume and setting up the upcoming awesomeness; I’m excited to continue with what comes next. We begin with Wesley Smith and how his co-workers had enquired about a “gadget” he’d told them he was using to experiment “new technology” with, but wasn’t the truth, since he was referring to his newly purchased Kindle which was gotten with a feeling of maliciousness. We then learn Wesley is an English instructor at a college in Kentucky who had aspirations to write a novel. Then we are introduced to his only friend in the department whom makes a joke about his name with a now classic rock band’s name and says something I can’t help but agree with about realists. Then they talk of how people spoke of their school like it was a good school, but how it was actually mediocre due to it being small and not prestigious. I have noticed already the style of King’s writing of this one is to repeatedly use a certain type of phrasing at least twice right next to each other, which I’m debating is supposed to be seen as sardonic, but discovering it being overused. We then get a description of what successes the school had and in what area of education, it not being hugely impressive and being in the sports department. Then we are told of Wesley’s ex who also worked at the same college, but different department and what may have gone wrong which then went into why he’d gotten his Kindle. 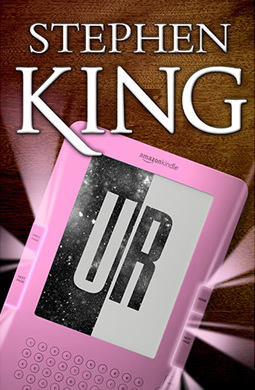 We then get a flashback of when Wesley first sees a Kindle, which he pretended he didn’t know existed in front of his class, believing when he did eventually get one, it would be to deliver a witty remark to his ex whom would see it and have it spark their first conversation since the break-up. When he bought the Kindle and had received it in the mail, he had gotten one which was pink which didn’t occur to him as odd at the time. After Wesley had told his buddy his break-up story and had gone home, he was starting to listen to his couple of messages left on his answering machine and was surprised to hear one from his ex who now apologized for her hasty reaction to his inattention and the cause of their fight which had ended their relationship, but could possibly be interested in rekindling after she’d finished an important away game with her team, which had gotten Wesley to believe the opposite of her supposition on the message of it being a bad idea. The second message is his ex continuing her message which went on to mention how she’d also heard about his getting an e-reader and how if it’s a Kindle he could go online, also believing he’d grown which had made her believe they could be ready to try again, but she’d call him and he should not call her first, since she wasn’t ready to talk to him about it yet. Wesley then goes online to see what discussions were going on about the Kindle, one being whether they’d ever come in different colors, which he then considers perhaps his was discolored in some way, then turning the e-reader on to discover whether it could go online, realizing it could, but was in the “experimental” section, also discovering another puzzling choice titled, UR Functions and clicking it to uncover what it meant, hesitating for a moment, but wanting to feel like a “modern man” and when he’d clicked the selection, the Kindle changes, having kolor and a black tower behind the welcome message. After trying out it’s search capabilities, then becoming spooked by its return message which only accepted numerical entries, he deciding to put in his birthday, even though he also thought he should put the Kindle somewhere out of sight. When the screen gives him more information about the entry requested, he realized he didn’t recognize some of the works given by the author he knew so well, detecting a few plus his date of death being different from what he remembered. He decides to buy the book only to see if it’s a fluke after confirming his purchase with a puzzling description after the accept button. Wesley then calls his buddy up to confirm his idea the novel he’d bought couldn’t be one of the author’s work, he getting the confirmation needed with a slight oddity in knowing the name of the dog being the same as the title of the book he’d ordered. After hanging up with him, he observes his download had completed and reads some of the book, it shaking him in knowing what he was reading sounded exactly like the author’s work, but unbelieving since it had been released after his death. He then tries a couple other author’s, some showing up and some not. After trying to go to sleep and leave the e-reader alone, he gives up for lying there and realizing he hadn’t tried looking up Poe. After ascertaining novels, he read one until morning and then slept for two hours. After trying to teach a class midway through the week, he realized he was close to losing his sanity with how many differences of works he’s been reading, his class realizing his odd behavior. One of his student’s confronts him after he’d dismissed the class for the day to enquire to how he was feeling, Wesley deciding to entrust to the young man what he’d been reading, asking him to accompany him to his office to show him what his e-reader was doing so he can decide whether he’s going mad. After showing Robbie, his student and his buddy Don what he’d been dealing with and how they each had a chance to read an author they knew well and being completely blown away with the results, Don suggests Wesley figure out who had sent the e-reader, to be sure it had come from Amazon by checking his credit card record online. Wesley learns he hadn’t been charged for the Kindle, but Don supposes wherever the Kindle actually came from, Wesley Smith was being charged. They extend their study session of the Kindle after the college closes, Don leaving temporarily to help his wife with the kids and Robbie joining Wesley at his apartment. Robbie brings Wesley’s attention to the other options in the UR Functions and wondering what they were, Wesley not remembering and going back to check, one being for news, selecting it and having Robbie put in the selection of what to look up. Wesley opens the door for Don as Robbie reads the news, it being about newly appointed President Hilary Clinton and who she’d replaced. They search sports before Robbie suggests checking for the JFK assassination. Wesley then sticks to one particular UR dimension, but after perusing for hours, he was becoming too tired to continue, but not before Robbie tries one more, Wesley being plagued with dread by the possibility of what pops up and the only selection available in the timeline. After they read the few articles available and being depressed with the results, they stop and leave Wesley’s apartment. Don leaves with the advice to stop reading those stories for how it could addict him, Wesley already realizing this and looking forward to future discussions, he then walking along the street a bit more with Robbie who lived only a couple blocks down. Wesley then goes to sleep and it being a deep and long one, deciding not to read ur-Hemingway the rest of the night. When Wesley wakes up, he goes to a local cafe where Robbie’s apartment was and gets some late breakfast. After taking out his e-reader and eating his breakfast as he read more Hemingway, he decides to check UR Local, it being a crappy local paper and the fees being much more expensive, Wesley compromising with the middle, slightly less expensive deal, then getting unsettling news after putting in the current date. The college school bus passes the cafe and Wesley gets to see his exes team cheering out the windows, he having his chance to wave at them everyone else, distracted by his eReader’s information, it giving him devastating news which Wesley immediately goes up to Robbie’s apartment to share. After trying to call his ex to warn her of the possible fate she and her team were in for and being interrupted and refused to be listened to, Robbie comes up with the idea to search for the lady who causes the bad news. They discern where she stops and see it’s a dive bar, also seeing the vehicle she drove and it’s foretelling bumper stickers. Wesley believes what they plan to do should be waited out until her last stop whilst Robbie thinks the moment would be better, but are unable to do anything since her reemergence from the bar happens then and drives off, they following. They learn more about the woman from the future news articles, giving her sad history and what she’d possibly done before causing manslaughter. As they follow her and notice her close calls with other cars, Wesley and Robbie lose their pity and get angry at her recklessness. After she stops again, they both do what they’d planned on, with success and wait in the car to see what she’d do next. Wesley goes a bit overboard, deciding not to only watch her, but approaching her to physically harass her into the reality of her actions. Robbie stops him after Wesley doesn’t seem to be able to stop himself, also getting the attention of the patrons and bartender, who watch but don’t engage and one man only deciding to go after them as they leave. As they depart, Wesley decides they should park near a cornfield rather than go home yet as he checks his e-reader for the UR Local which was now unavailable, but not worried about it and felt no guilt for breaking the rules the UR program had given, waiting to see if the school bus would return their way and when it does, they’re both happy to see it and join the already trailing cars behind the bus, parade-style deciding to join them, as well. They make it back to town, everyone in one piece, but Wesley is now wondering what repercussions he’s in for due to his dimensional violation, soon going home and spotting a car parked in his spot. Wesley is unnerved by the vehicle itself and touches it, feeling even more uneasy due to it’s strange warmth. When he goes to his apartment he’s greeted by an oddly not quite human voice, revealing two men inside of opposite ages. We are then given description of their attire which makes them obviously a part of the low men in yellow coats. As one asks Wesley why he thought they were there and he not actually knowing even though he thought it was due to the laws he’d broken, one of them tells of the Tower and rose being affected by it. Wesley is then given a chance to explain why he’d knowingly broken the laws, he listing the reasons of those who would have died and the selfish drunk involved. The low man then tells Wesley of how ignorant he was to do such a thing since what he’d allowed to happen could change the course of history for someone who may have survived the crash who was meant to die for being an evil character and dealing death in the future. Wesley of course hadn’t thought of those possibilities and the low man continues they won’t know for certain since the ability to see the future only works in a six-month-radius after which there’s no clue. Wesley then confesses he hadn’t ordered the e-reader he’d received, the low men considering a mistake in shipping was most likely the reason, the older low man professing of everything in the end serving the Tower’s purpose. Wesley then gives up the e-reader upon request and the low men allow him his freedom, threatening worse what would happen if he ever got mixed up in a situation like this again. Wesley is visibly shaken by his encounter and he lies down to calm himself knowing he won’t be sleeping any time soon. He then hears his cell go off, but isn’t in time to get the call, listening to the message recently left. It was Don telling him to check the morning paper, he going out to uncover one and reading the head-line. He has a loud reaction and runs upstairs to make a phone call. This story may have started off weak, but made a turn around pretty quickly, being exciting the rest of the way through; I enjoyed this indirect connection to the Dark Tower series and now can’t wait to read the follow-ups.